Do your clients find it difficult to socialize? If they do their best to avoid situations where they have to go out and meet people, especially ones they don't already know, your clients may be suffering from a form of social phobia. The Fear of Meeting New People can also be caused by the fear of being rejected by others or your client may be exceptionally shy, timid or lacking in confidence. 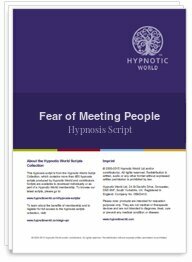 The fact that they are consulting you means that they are already prepared to deal with this issue and this Fear of Meeting People script from Hypnotic World can help you to help your clients to overcome their barriers and actually enjoy going out and mixing with others.